Recently, Rick Simi did a nice short article on the Chevalier amber square "bitters" for Western Bottle News. An observation that he made regarding the whiskey related products of F. Chevalier & Co. rang true. 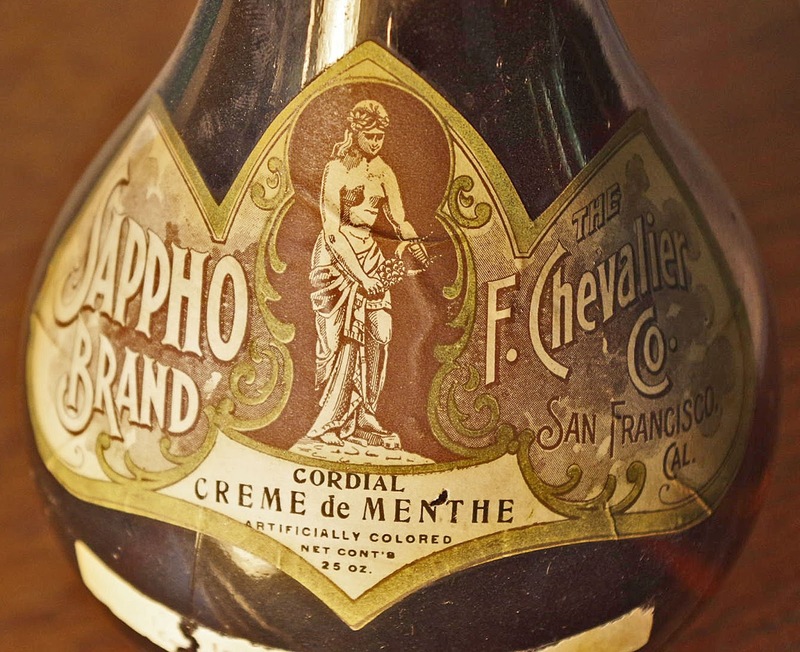 He stated; "Meanwhile the F. Chevalier & Company was producing some of the most desirable and coveted glass containers ever blown on the west coast. The spiral neck Chevaliers Old Castle Whiskey, F. Chevalier red whittled Whiskey merchants fifth and the Chevalier Castle flask are all considered extremely collectable and high dollar additions to a western bottle collectors shelf." How right he was! The above mentioned fifths and flask are regarded by most as being some of the "holy grails" of western whiskey collecting, and the prices that these bottles command reflect both the rarity and desirability of each and every one. 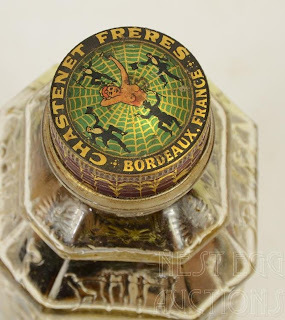 Most collectors are familiar with the amber cylinder fifths embossed either "OK / Old Bourbon / Castle / Whiskey / F. Chevalier & CO. / Sole Agents" , or "Old Bourbon / Castle / Whiskey / F. Chevalier & CO. / Sole Agents". The OK is seen with an applied top in various shades of amber whereas the variant sans "OK" is seen with both applied and tooled tops. Another relatively available early bottle is the brandy embossed "Chevaliers" on one flat panel with "Ginger Brandy" on the opposing side (also in a flat panel) and "Trade / Mark" to the side of the "F.C.&Co." logo on the shoulder. The brandy is shorter and smaller in diameter than the Old Bourbons and are closer to a sixth in capacity. They are also seen in various shades of amber with the most common being a medium orange amber (somewhat akin to a ripe dried apricot). 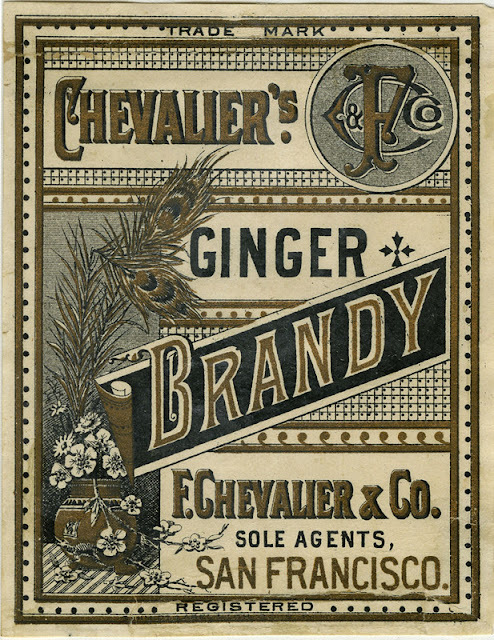 All I've seen have an applied top although, oddly, Chevalier did not trade mark the brand until comparatively late; Feb. 12, 1884. The label that the bottle sported was an interesting and attractive design, although not colorful in any way. There are, however, some rarities produced by F. Chevalier & Co. that are well within the pocketbook range of most western whiskey aficionados'. Instead of thousands of dollars each, we are talking in the lower hundreds. One of these affordable and yet highly desirable bottles is the earliest Castle picture fifth, which is just a day or two past the glop top era. At first glance, one might be inclined to pass it by on a bottle show table, thinking that "it's just another Castle". A second look though, reveals much more. The embossing is notably different than the later examples. It's boldly cut and the lettering and the castle are both extremely bold. The banners above the castle are so well pronounced that you can almost hear them snap in the wind. The bottle itself is much slimmer than the later examples and the few examples that I've seen of this early cork top variant are generally quite crude, in keeping with early 90's SF glass production. This variant is as scarce as many of the bank breaker glop tops and is highly under rated. Often overlooked as well, are the labeled only examples. Once in a great while, something used to slip through the cracks on eBay. Now, not so much... About fifteen years ago I used to follow new listings like a hawk in hopes of getting tossed a bone in the Buy It Now section. Sure enough, a bottle showed up early one morning that caught my attention. It was a labeled only example, but was quite obviously "honest" (not a marriage of a loose label that had been slopped onto an old bottle the previous week). The F.C.&Co. logo on the shoulder of the label is what initially caught my attention. Yep, identical to the Ginger Brandy, although the bottle itself was a shape that we don't normally associate with western whiskies. And the label itself is written in a combination of both English and French. From what I could tell, the product was Apricot Brandy, with an aged Cognac base, made in Bordeaux by Chastene Freres. 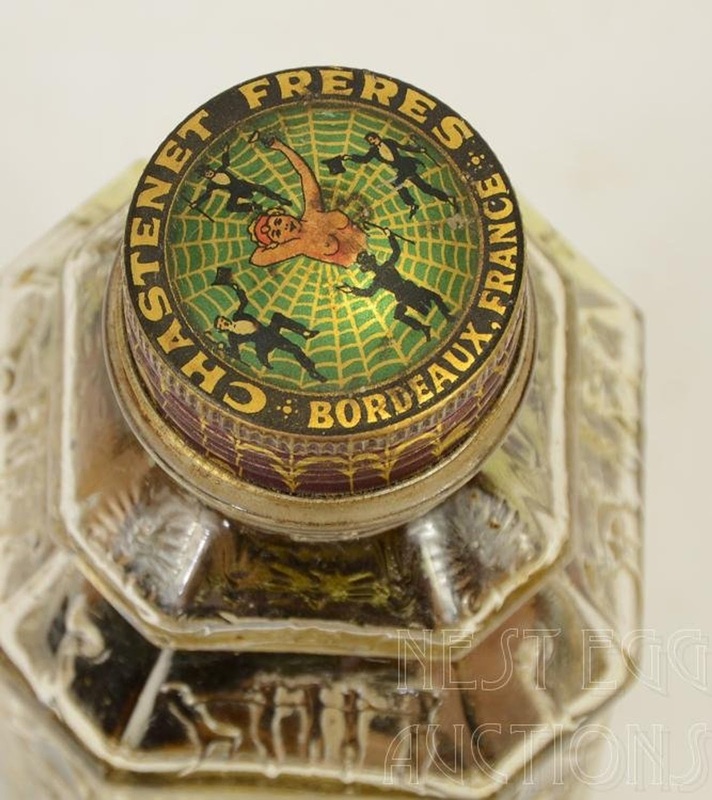 A quick search of 19th Century French liquor makers by the name of Chastenet Freres was met with success. The label on a bottle of Chastene Freres Creme DeMenthe speaks for itself in terms of their target market. The Chevalier bottle itself is unusual in that the top was rolled inward, with spillover on the inside of the lip, then tooled out into a square collar to accept a cork. The glass is an unusual light yellow orange color and the body of the bottle is hammer whittled. It was a neat, rare, and comparatively affordable addition to my collection. Another labeled example caught me by surprise a number of years ago. Once again, a non-conventional looking bottle containing an equally unconventional product with a brand I'd never heard of. And yet, there it was in black and white; "The F. Chevalier Co.". But Sappho Brand with a Greek Goddess motif? It turns out there was a common thread after all. Sapphos was a female poet who lived on the island of Lesbos in the 7th Century BC, who appealed to the sexuality of budding young Greek maidens. 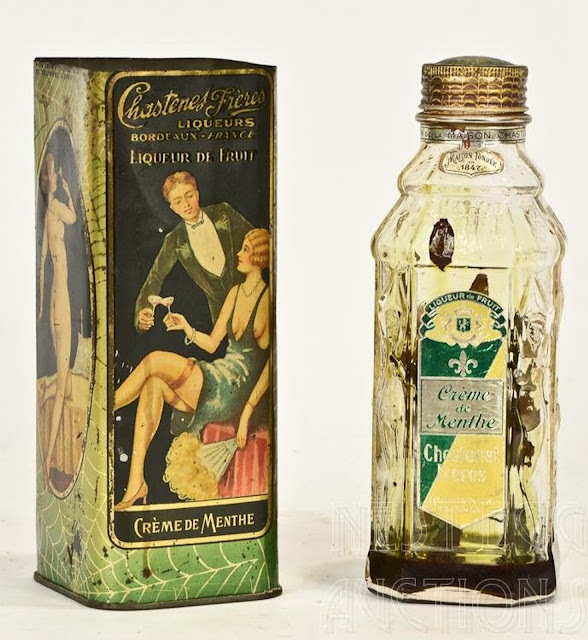 And this bottle contained Creme De Menthe as well; although the label is quite a bit tamer than that displayed on the Chastenet Freres version of the same~ The Chevalier bottle is fairly easy to date since the first reference to "The F. Chevalier Co." appears in the 1902 S.F. Directory. Yet, no reference on the label to the Pure Food & Drug Act so, 1902 - 1906~. I'm sure that there are a lot more label only Chevalier bottles out there and would love to add your photos to this article. Feel free to send me your photos and I'll post them. Well researched and well written Bruce. I always learn something from your posts. Keep up the good work.